Enerdes has designed air handling units for the worldwide patented semi-closed greenhouse system to create an optimal climate in the greenhouse and have better control. An air handling unit will put the air in motion and provides an optimal temperature. An air handling unit can use both inside air and outside air. The air from the greenhouse itself can be re-heated or cooled using a heating element. The outside air enters through the cooling pads to the air handling units. By cooling down or heating up the air, the air handling unit can provide an optimal temperature or humidity to the greenhouse. Enerdes has developed various air handling units for different greenhouses. Our smallest air handling unit is designed specifically for greenhouses where space is limited and the gutters are relatively short. 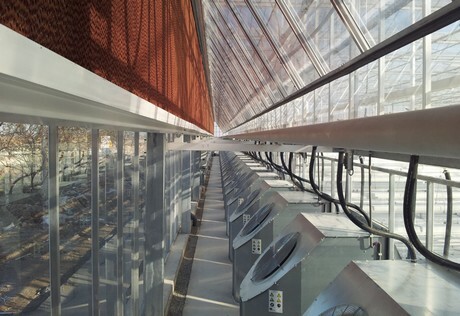 Our biggest air handling units are designed for large greenhouses with long gutters. 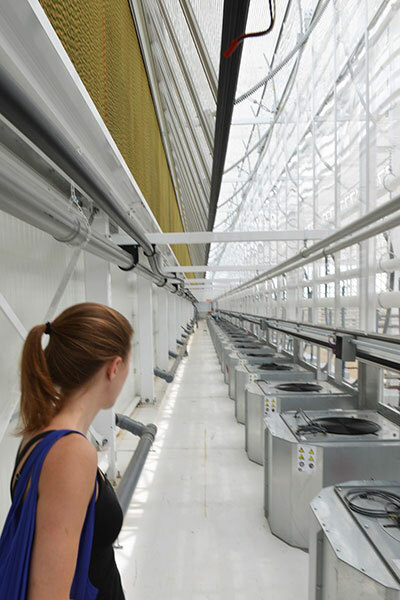 For example, at the 128-acre greenhouse from Windset in Santa Maria our biggest air handling units are installed. In addition to size, we distinguish between air handling units with radial and axial fans. When space is restricted and a greenhouse is bound to existing environments this model is the preferred choice. This air handling unit is specifically designed for mild climates and/or medium sized path lengths. This air handling unit is specifically designed for large sized path lengths. This budget version makes use of an axial fan instead of a radial fan.